As I mentioned last time there are three levels in Horse Stance training and we can combine these together. This is what is special about Horse Stance practice. There is the High Position which is the basic level, the Medium Position which is the normal level and the Low Position which is the high level. Horse Stance practise develops your bones, your Qi and makes your grounded, which means it centres your body. When we have strong bones then our Qi and blood will be stimulated and will create a fast circulation which can clear the blockages and internal problems. A lot of hidden illnesses need strong Qi circulation to clear them up. Strong Qi circulation equals strong blood circulation. This is why we feel warm when we practise Qigong, because the strong flow of Qi creates a strong flow of blood. A strong circulation comes from our bones being worked out by standing for a certain amount of time. In order to stimulate a stronger flow of Qi we need to use the High Position and the Low Position of Horse Stance together. However this is not for everybody and not everyone can do the Low Position Horse Stance and so they should use the Medium Position Horse Stance. 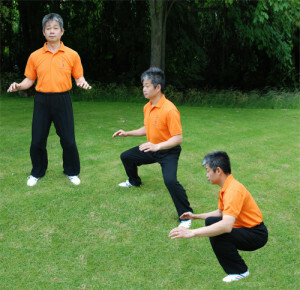 This means when we do Horse Stance we should start with the Low or Medium Position and when we are tired we should move up to the High Position. Then when we have rested and feel strong enough we can go back down again. So we can move between the lower position and the High Position again and again.